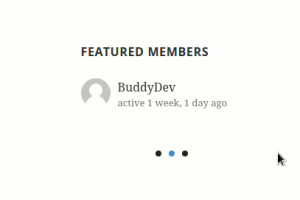 BuddyPress featured Members plugin allows site admins to mark users as featured and display the list of featured users as list or slider. Each shortcode/widget can be displayed as a list or a slider of users. 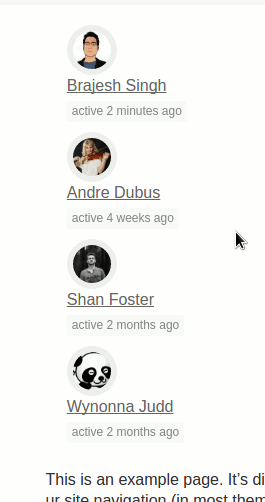 Easy API for marking a user as featured/removing user from the list of featured members. 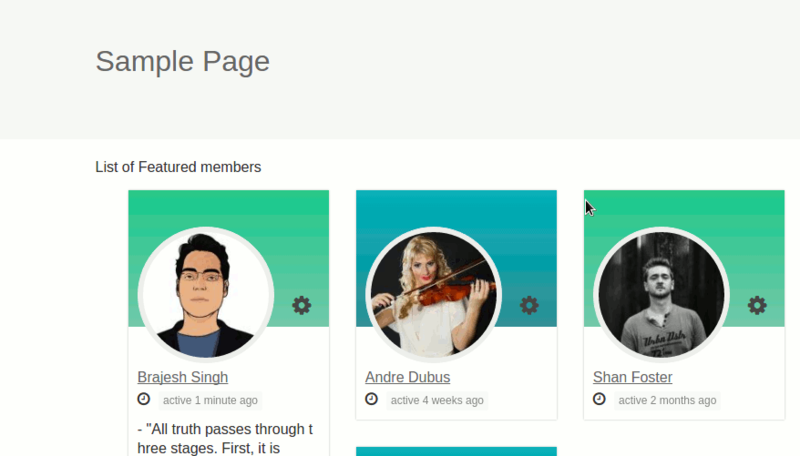 If you are the site admin, you can mark user as featured member from the members directory list or from the user profile. You can remove the users from the list using the same way. 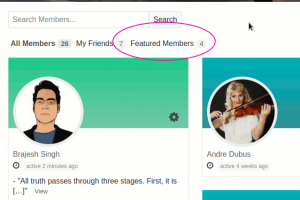 view(string):- It controls the display of the members list. Possible values are ‘list’, ‘slider’, ‘default’. Default ‘list’. max (int):- It limits the maximum number of users displayed in the list. 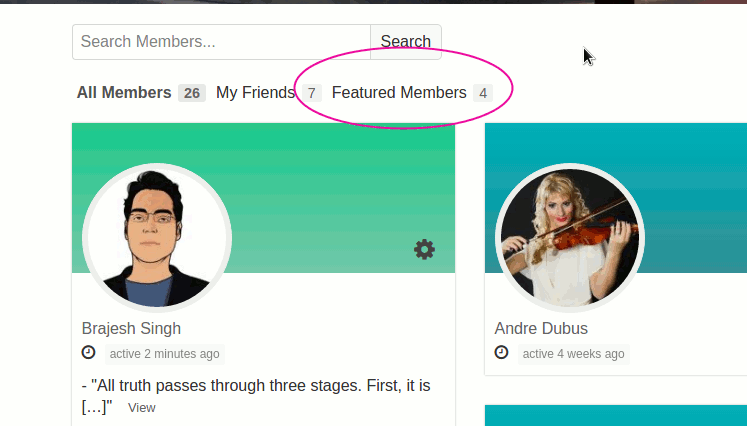 default 5.
member_type(string):- Filter featured list by member type. avatar_size(number):- Specify a number as avatar size(e.g 50 means 50px). 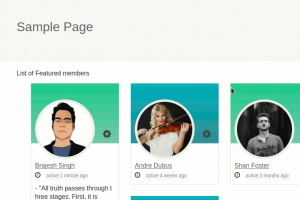 slide-item (int) :- How many members to display per slide. default 1.
slide-slideMargin (int):- Margin between two slides. default 0.
slide-mode (string):- How the slides transition works. Possible values are ‘slide’, ‘fade’. Default ‘slide. slide-speed (int):- slide transition speed. default 400.
slide-auto (int):- Whether to auto start slide. Default 1. Possible values are 0, 1.
slide-pauseOnHover (int):- Whether to pause slider on mouseover. Default 0.
slide-controls (string):- Whether to display pre/next slide control or not. slide-loop (int):- Whether to loop back to the beginning the slides when reached the last element. 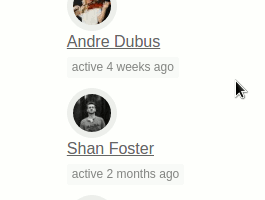 In case you want to add/remove/check featured members. We have got you covered. To disable Featured Members tab in members directory, please put the following code in bp-custom.php or the functions.php of your theme. Most of the time you won’t need to do it. In case you want to add more information to the members list/slide etc, you can easily do that in a future proof way. 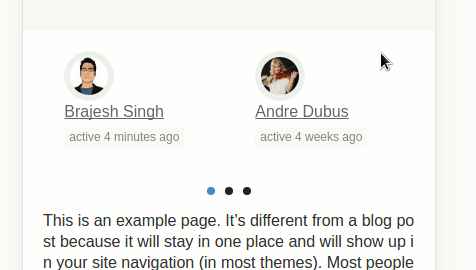 You can override the template used for displaying featured members list/slider in your theme/child theme. where bracket () means that part is optional and will depend on your theme. We suggest to follow the convention of your theme. If you need to modify the template files, is recommended to copy the template files from plugin(or at least look at the structure). 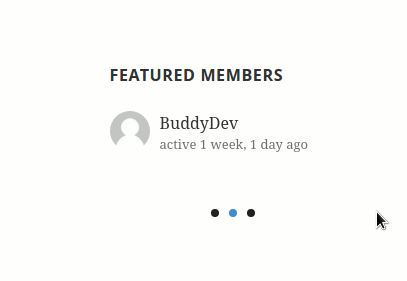 Problem:– The featured members list is empty. 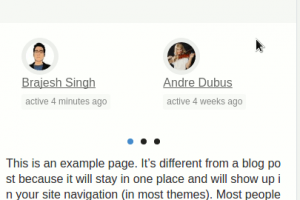 Credits:- We use the light Slider jQuery plugin by Sachin while the slider view is used.